The Merrion Centre is pleased to announce the UK’s largest independent travel agency, Hays Travel, will be joining it’s mix of shops, bars and restaurants in the city’s Arena Quarter from 1st November 2018. This will be the first Hays branch in Leeds city centre, contributing further to the Merrion Centre’s expanding offer and fulfilling its ambition to offer even more choice and variety to the abundance of shoppers, students, students and office workers located within the immediate vicinity. Creating 6 full time colleagues, Hays will offer European and Worldwide holiday packages; cruise, luxury, and tailor-made vacations alongside foreign exchange services. 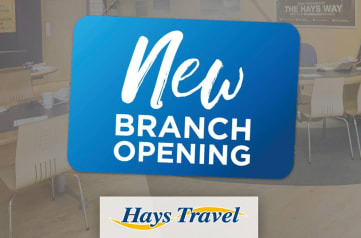 It will also have its own local Facebook page, promoting special offers whilst driving Hays new finance scheme where customers can ‘spread the cost of their holiday’ in monthly payments with the final balance due six weeks before departure. Jenny Brooks, Regional Sales Manager, Hays Travel: “We are thrilled to be opening our 171st store within the Merrion Centre. Leeds city centre has lacked an independent travel agency and being at the heart of the city was the next obvious location for our continued expansion. With significant investment over the past few years, the Merrion Centre continues to see high footfall levels and we look forward to introducing our exceptional service and travel expertise to new customers whilst becoming further established in the Yorkshire region”. Vanessa McIntosh, Asset Manager for Town Centre Securities (TCS) owners of the Merrion Centre said: “We have been keen to secure a travel agency service for our customers and visitors for some time and are delighted that the leading independent travel agency in the country is joining us. They have a fantastic reputation for customer care and great service and I am sure they will be a popular addition for those looking for a sun, ski or city break.